Welcome! I am so happy that today is the first day of Spring! The fact that I am looking at a pile of snow outside my window will not deter me from continuing to bring Spring indoors! Don’t you just love this time of year? The change in Seasons is always something to look forward to. 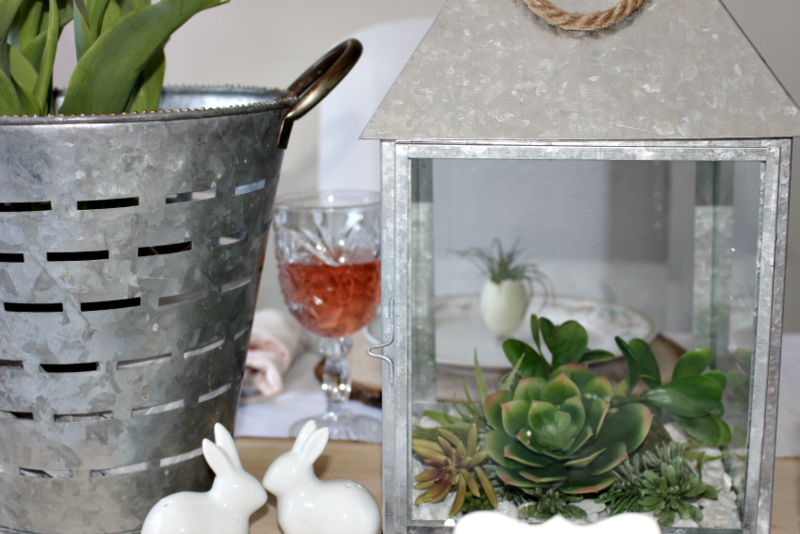 With Easter just around the corner it’s time to think about setting a welcoming Spring table. Today I want to share my Modern Farmhouse Style Spring Tablescape with you. 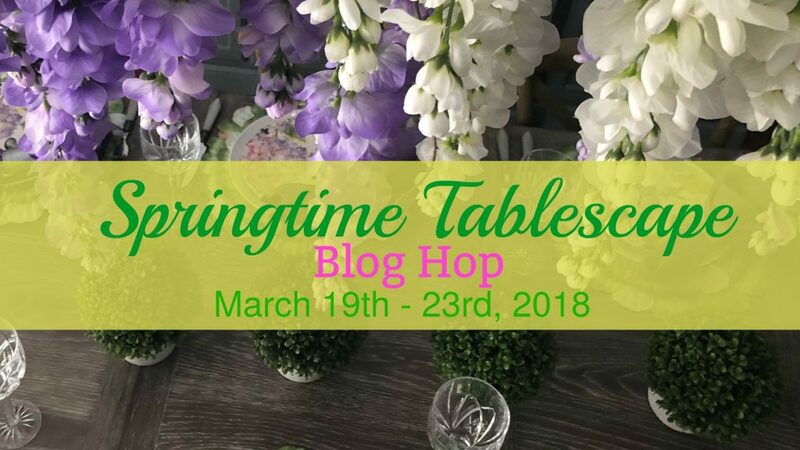 First I want to thank the very talented and sweet Chloe from Celebrate and Decorate for hosting this Spring Tablescape Blog Hop. There are 22 creative bloggers sharing their Spring Tablescape ideas throughout the week. All the links are below so you can hop on over and check out all of the Spring ideas. Tulips are such a symbol of Spring and these are especially great as they are potted plants so I can actually plant them outside once Easter is over. I did that last year too and have my fingers crossed that they will come back this year. Once I had my inspiration piece, the Modern Farmhouse Style was decided. 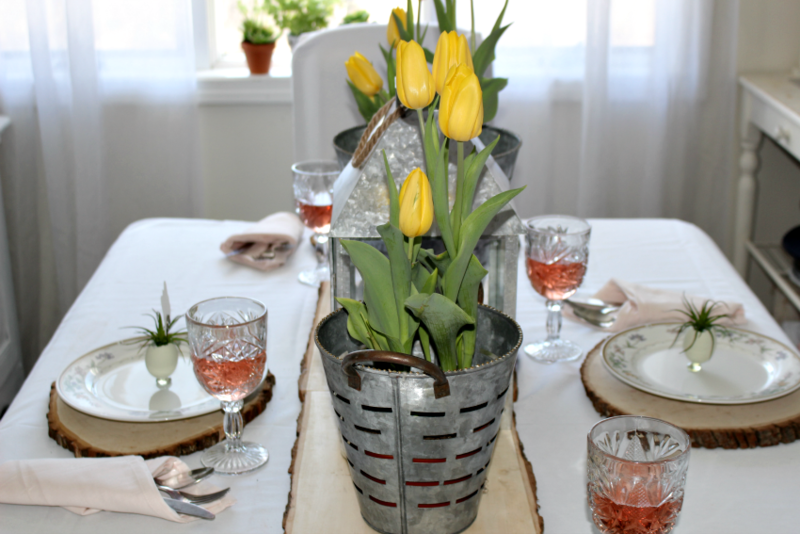 I happened to have two gorgeous Galvanized Metal Olive Buckets that were the perfect size to display the tulips. I placed them on a Rustic Basswood Country Planks to act as a runner atop a white tablecloth. A large Galvanized Lantern filled with succulents fits perfectly in the center of the buckets. You can see how I made the Succulent Terrarium at Centsible Chateau here. Next up, I brought out my Wood Slice Chargers to go along with the runner. If you follow me on Instagram, you may recall these beautiful Spring dinner plates I found at my favorite thrift store 8 for $4! If you don’t follow me on Instagram, I would love it if you would. You can follow me here. 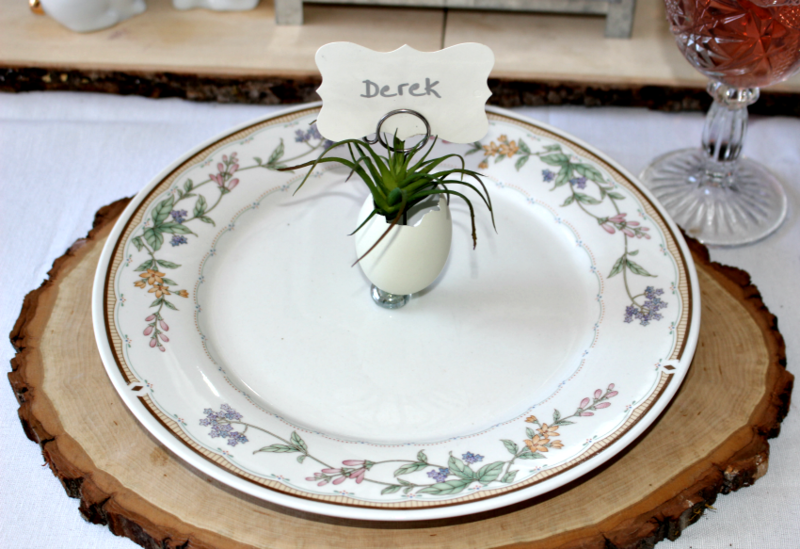 I added egg shell planters with air plants to serve as a place card. The air plants go along with the succulents in the centerpiece. How cute are these little bunny salt and pepper shakers from Target? Love! Sparkling pink champagne fills the thrift store glasses and pale pink linen napkins complete the place settings. 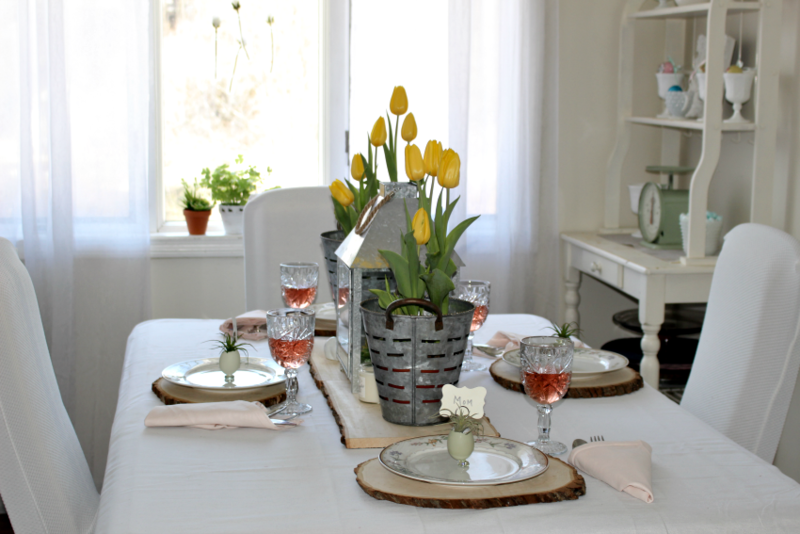 It’s a simple, but I think welcoming Spring Tablescape that almost has a garden theme to it. I hope you enjoyed my Modern Farmhouse Style Spring Tablescape and will visit the other bloggers below. 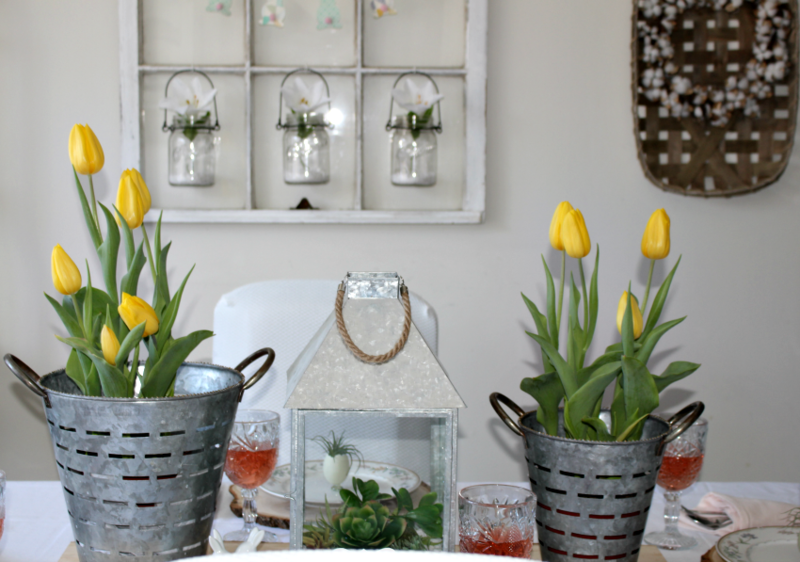 You can see the rest of my dining room decked for Spring here and my Spring Mantel here. Also, come back tomorrow as I have a fun Spring Vignette along with a great Giveaway! Do you like Giveaways as much as I do? What a bargain your thrifted plates were! I love them paired with the tree slice chargers and galvanized metal. 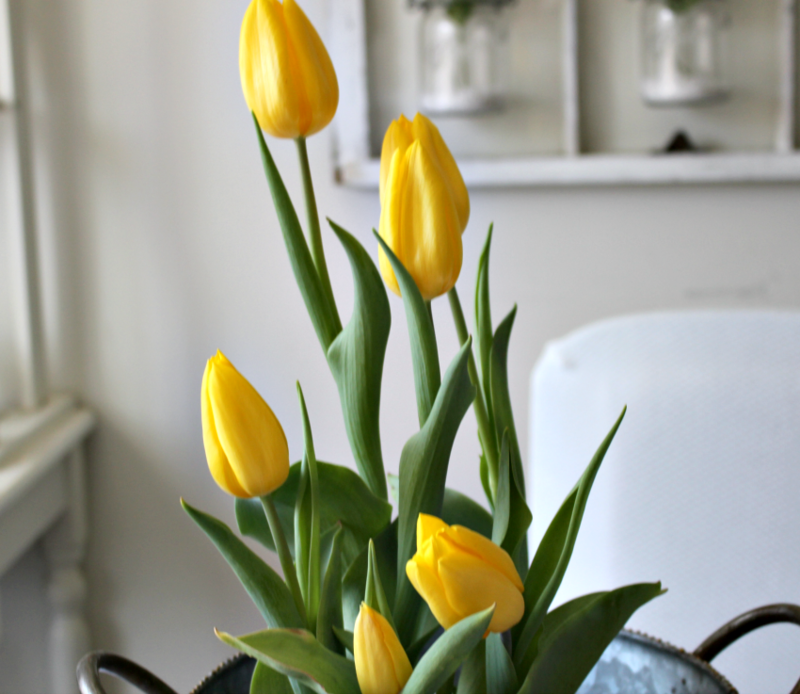 The bright pop of the cheery yellow tulips is always a welcome sight! Very nice table, so pretty with the yellow tulips. Clean and simple. I love the bright yellow tulips with the galvanized metals, that just reminds me of the beauty of spring popping out after a rough winter! I just started following you on Instagram!! It’s always a pleasure to do these hops with you! Great table!! Michelle you did a wonderful table! I absolutely love the galvanized pots. Plus nothing says Spring like that gorgeous pop of yellow. Beautiful table! Those yellow tulips are gorgeous! They really make a statement. I love the galvanized olive buckets and hurricane lantern. Great idea to fill it with succulents. Best idea ever is the air plants in the egg shells. Adorable!! Your modern farmhouse table is beautiful! Your tulips are regal! I love tulips and they are so refreshing as they are the first spring flowers available that aren’t around all year. They look lovely in your olive buckets. The yellow color is so cheerful! They are very fresh and look great on your farmhouse table. Bonnie Morgan recently posted…It’s No Secret That I Love Flowers! 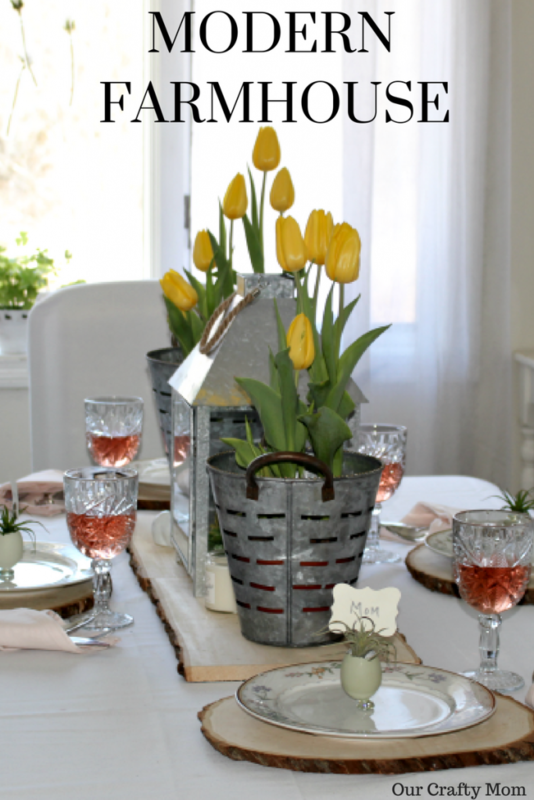 Tulips are a definite sign of spring and they look great in your galvanized olive buckets! I love your thrifted dishes and they look so pretty on the wood slice chargers! 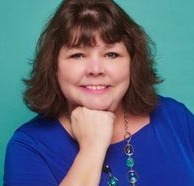 It is a joy to blog hop with you! 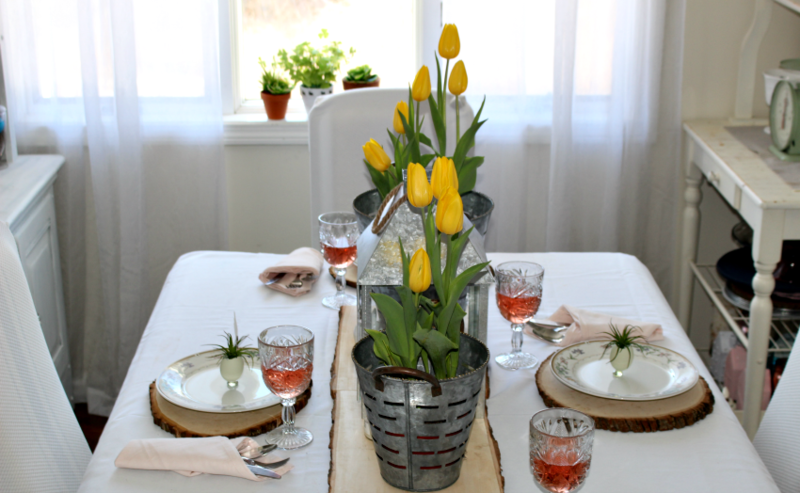 So so pretty tablescape, I love the simplicity with the bright yellow tulips, my favorites. The natural-ness of your place settings is adorable. I have the olive buckets too, but I put one of mine outside in the Florida weather for a couple weeks and it isn’t so pretty as yours. 🙁 I enjoy blog hopping with you. Beautiful, clean and crisp lines, you certainly captured the beauty of Modern Farmhouse. I grew up on a farm and Mom often times used a freshly ironed white Tablecloth to grace our Sunday dinners. It is all so very lovely! Those tulips are stunning! 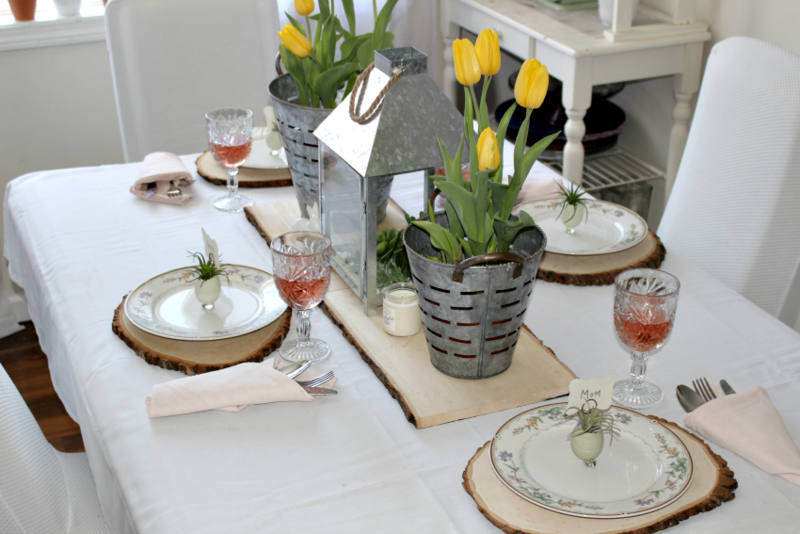 What a beautiful farmhouse table you have set for spring! Every looks so pretty!!! Happy Spring!!! I adore those egg shell planters utilized as place cards. They work perfectly for Easter and the green air plants are perfect for setting a spring mood! I love the crisp clean elegance of this tablescape, just lovely. Michelle, Yellow tulips are a perfect sign of spring and your plates are lovely! Love it! Michelle, simply chic, a great farmhouse look. I love buying grocery store potted flowers like your tulips, so they can later be planted. I also love these blog hops to see what bloggers are finding (like those adorable bunny s&p). It’s like personal shopping, and if we like it, we might get lucky and find the items too. Of course, my heart and eye are always drawn to vintage items. I’m glad you added a dose of that too! Great table Michelle. Those galvanized olive buckets are awesome. The tulips are beautiful. Love the addition of your wood slices. Michelle I love your modern farmhouse table styling! Your egg planters as place markers are adorable and those beautiful yellow tulips steal the show. I love the earthy, garden feeling of your setting. Fabulous job! Your table is just lovely! Don’t you just adore tulips? Happy Spring! My kind of table! Lots of thrifted items and super sweet and charming! There are so many things about this table setting that I adore – the metal buckets, the succulents and air plants, but most of all how the simplicity gives it such a modern, fresh look. I like settings that are less fussy, and you nailed it. Love this! Spring is my favorite season and I love tulips! These yellows are certainly beauties. 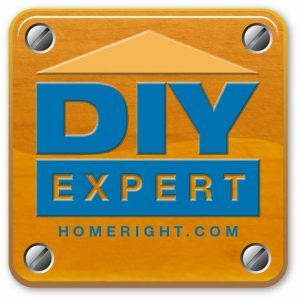 I adore farmhouse style and you did a fabulous job! Thanks for sharing with Share Your Cup. I’m sure it’s not intentional, but I’m not seeing a link back to the party. Thank you so much Jann! I added you to my party list. I am so sorry for the oversight and thank you for hosting such a great party! Happy Friday! Such a nice garden themed table. I like all the green Michelle. The natural wood, the air plants, the succulents and of course the tulips, it’s such a pretty farmhouse style garden theme. After reading your blog for awhile I keep an eye out for thrift store dishes. You certainly have an eye for finding nice ones. Thanks for the inspiration. I love your yellow tulips and the olive buckets! Such a sweet farmhouse vibe for spring! I love the farmhouse design & this table is beautiful. I’ll be featuring this in my Farmhouse Decor Ideas for your home next week at Merry Monday Link Party at 6 pm pst. I’ll see you at the party. I am finally able to catch up on my comments during the hop, but I was traveling during the time. 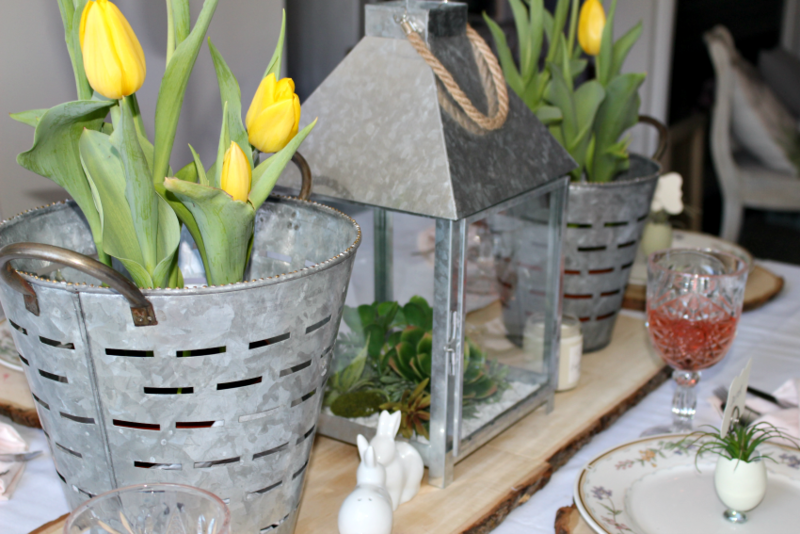 I am so happy to see that you used the galvanized steel candleholder and buckets for your tulips. It certainly goes well with the idea of Spring. The succulents are so lovely and the wood slices really give it all a natural, pure element. The yellow tulips pop with color against the silver color metal. Truly lovely.